Aren’t baby owls called “chicks”? Unlike some birds, baby owls are actually called “owlets”. 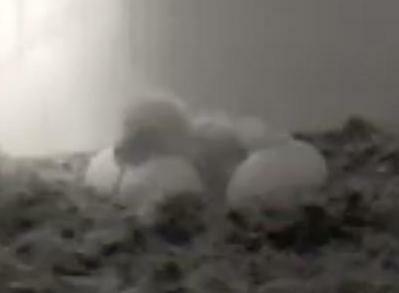 What happens after the owlet hatches? Molly removes the eggshell to help it get out. She sometimes “talks” to the owlet. She keeps her face close to it and gently “rubs” her beak all over the owlet. Some watchers get concerned that she might eat the owlet, but there is no cause for concern. She seems to shield the owlet from the door and also “cuddles” it. This behavior is important for the imprinting of the owlet to its mother. The newly-hatched owlet is squawking! Does it need to eat right away? So far, neither Max nor Pattison were fed immediately. Molly usually rubs them for a while and then tucks them under her to keep them warm. What does an owlet look like? When the owlets hatch, they are mostly pink with a few white feathers. In a couple of hours, they’ll start getting whitish-yellow fuzz. In a couple of weeks, their eyes open. In a month, they will have a heart-shaped, white face that matches Molly and McGee’s. They grow quickly! Birds of prey are the fastest growing vertebrates and barn owls reach adult weight and feathering in 8-9 weeks. When do they open their eyes? Baby owlets eyes will open 10-12 days after they hatch. How can I tell them apart? 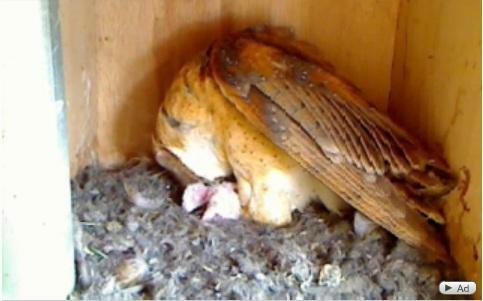 Because the owlets hatch about 2 days apart, each one will be at slightly different stages of development. See this link for the hatching order. How are the owlets fed? Molly and McGee tear off very small strips of meat and pull them across the owlet’s beak. They do not regurgitate the food like some birds do. This behavior also causes the gastric juices to start flowing in the owlet’s stomach to digest the food. Will sitting on the babies smother them? No. If you look carefully, you will see that Molly puts most of her weight on her legs, and not on them. The owlets put their heads down and curl up into an egg shape. They are warm and have all the air they need under there. Can the owlets fall out of the box? Molly watches them closely, and the edge of the door is high enough that it would be difficult when they are small. Even the owlets themselves have a sense not to get near the nest edge. However, if one does fall out, Donna and Carlos will not interfere or rescue. While this might be hard to watch, it’s important to allow nature to select the ones that will survive. As the chicks hatch, how will Molly make sure they all eat, or do the fittest survive? Sometimes the youngest ones don’t survive. Because barn owl eggs hatch in the order they were laid, the older, stronger owls get a head start on the ones that are born later. Do owlets eject or hurt other brood mates? It’s possible, that older owlets could hurt younger ones. This is how the strongest birds survive. However, barn owls are among the few birds whose young actually play together. How long will the owlets stay in the nest before they leave? Owlets will stay in the nest box for about 49 – 54 days before they are ready to fly. This brood will leave the next sometime between May 19 and May 24, 2010. Will McGee help feed the babies? Yes, McGee catches food for Molly and the babies. Two weeks after the owlets hatch, Molly will hunt for food too. What are the names of the owlets, and what significance do the names have? “Max” – Max is Carlos’ friend of over 40 years who recently turned 80! “Pattison” – Pattison Elementary is the name of the first school with which Carlos did a live question and answer session via Ustream with students. “Austin” – Is Carlos and Donna’s tech-savvy grandson who helped set up the social media side of the Molly experience. How long until the babies fly the coop? Somewhere around May 10-15, the owlets will “fledge” and take their first flight. Can the eggs or owlets get too hot? Yes, it is possible that they could get too hot and die, but not likely. What is their survival rate? In general, only 25-40% of the owlets live long enough to breed (about 8-12 months). It’s important for viewers to be aware that there’s a possibility that not all the owlets will survive. The Royals intend to let nature take its course, and will not interfere or rescue the owls if anything happens to them. We have a Barred owl in the neighborhood! My husband & I are very excited about this, I think the owl has two different nest locations. One nest is in a dead oak tree and I believe the second is in a pine and looks like a large nest of leaves, twigs, etc.. I was wondering when the barred owl usually lay eggs & when do the eggs normally hatch. Is there any way we can keep this owl around for a long time. The most exciting part of this, we live in town, a small village actually & there are houses on all sides of both nests. 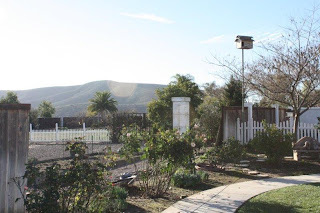 My husband & I have three lots in back that are vacant & I am wondering if we could build a owl box to encourage keeping the owl(s) around for a long time. Connie, From what I have read if you have an owl in the area and it has plenty of prey (and areas such as wooded land to support the amount of prey they need) I think an owl box would be perfect from what you describe. The Barn Owl Trust has great information on how to build a box! Do young owlets make ‘peeping’ sounds,like other birds, or only the hiss I have heard. I have a wax barn owl candle just like Molly I want to send you. Can you give an address to send this? I really want you to have it for your control room. i am a 13 yr old girl and i simply adore animals! but i was trying to find the price of fertile barn owl eggs and how long they live. i’ve been searching all over the internet and simply can not find anything. i think they are the most awesome owl ever! and i really wanted to get one so i was wondering if you had to have a licence to own one. You dont need a license for owls that dont migrate. I am a licensed wildlife rescuer and rehabilitator. I specialize in birds of prey. All animals should be left in the wild where they are born. There is nothing wrong with giving nature a hand sometimes its needed.Heal it and release it back where it was found injured. Thats the best part of my job, releasing them after they are healed and recovered. I love watching them fly free again. I have a saw whet(screech) owl that came to me with a broken wing that was healed incorrectly. I would release him if his wing could be fixed. His wing has been bad for more than 10 years. We are supposed to put the ones who cant be released down, but, after putting so much time and effort into saving them its hard to do. They are beautiful creatures. I keep his life as normal to living freely as i can but it isnt the same. I had another for awhile but he was healed and released. My email is kjw2011@hotmail.com if you want to know more. Also angeldragonfire36@yahoo.com. they are called owlets not chicks. How do baby barn owls behave? I would really like to know about the skills they develop as they grow older too. Please reply ASAP because I need the information for Thursday 24th of November! Hi – my brother just found may be a 5 week owlet, its quite small with its wings tucked. It cannot fly as yet, but tries to . It runs and jumps. What sort of meat should i feed it ?? i fed it bite sizes of raw beef which it liked and ate well . Is that ok . Is milk necessary for owlets?? We have a nesting box in our yard in Pleasanton, CA. I can see them on top of the box late at night. When do the owlets leave the nest for good? There are three sitting on the box. I think it is able to fly. More than likely the owl will stay in the tree if not disturbed and Mom and Dad will come check on it tonight. Normally with some food if it is a baby owl. It could just be a small owl. When Molly first showed up we thought she was a baby but as it turned out she wasn’t. how long does it take for a baby Western Screech owl to hatch? Nice pictures of baby owl.thanks for sharing pictures with us.good post. I was wondering if any1 could help…. we have a little owl, it used to be really quiet but for the last 3weeks or so its started squawking every nigh. Does any1 know why this could be? i have been told it maybe because it is breeding season how long does this last? How much time baby owl taken for growing? I love Barn owls, I’m doing an essay on Barn owls and these facts are very interesting. Thank you so much for this info. Hello. I found a little baby owl this afternoon in my yard. At dusk the mom came down and fed it. My question is do you know if its possible for the mom the carry the baby back up to the nest?? Hello. We found a baby owl in our yard this afternoon. At dusk the mom came down and fed it. My question is can the mom carry the back up to the nest?? The mother owl will feed the chick on the ground and then in the cover of night help/show the baby how to get back to the nest but they don’t carry them. Or at least I have never seen them do that. We once watched as a younger owlet that was just learning to fly but hadn’t mastered the technique yet go to the ground. We were very concerned it wouldn’t be able to get back to the nest that was 15 feet in the air but soon an older owlet show up to help. It then proceeded to show the younger owlet how to get back to the nest by jumping up on a lower fence first, walking across the top of that fence to a higher 6 foot fence then using that fence as a launching pad to climb up a near-by ladder to get within jumping-leaping-flying distance to the nest. We watched in amazement as the older owlet did this not once but several times until the younger owlet followed it back to the nest. Keep in mind that all events that happen in nature are learning events. Yes the mom did lay on the baby and still is. Im worried about people seeing the baby owl and trying to take it.they are in my front yard close to the street. It is way too young to fly. I just hope people will leave them alone! Should I move the baby closer in my yard to my house where the mom still knows where she is but people cant see them as easily? how does a mother owl teach her baby? why does barn owls flege in 60 days and elf owls in 30? I just had someone bring me a baby owl they found, I have a business in the Florida everglades and have experience with animals and would like to bring this baby owl up here as 1 of the family but have some question I would like to ask like, what do I do about water for the baby, do i just feed it shredded meat by hand as the parents would? No formula? I have a screech owl nesting box in my backyard, and a pair of screech owl who have nested there. Today I discovered a dead newly hatched baby owlet on the ground below the box. It’s eyes hadn’t opened yet. Does mom discard of deceased hatchlings this way? I know the baby couldn’t have fallen out the hole. I’m curious as to what could’ve happened. Do you have any ideas? This is my first experience with screech owls. Thank you! How long until the owlets can be away from there mother? I love baby owls…they are so cuddly! Hy, what a baby owl should be able to do to be set free in the wilde? I teach at North Forney High School in Forney, TX. Outside my 3rd story window we have an owl that made a nest and laid eight eggs. Only one of the eggs hatched. It is now about 4 weeks old. I am very concerned because the mother has not been seen all day. I am afraid she has been hurt or killed or just abandoned the owlet. Should we be concerned? Who would we call the rescue the baby? I would give the mother owl 24 hours to show up. You can look up animal rescue in your area. They will know what to do. I have owls in my Bost house. They keep me awake at night as I live over boat house. The nest is about 30 feet from water. They are in crawl space, between the crawl space where water line and sewer from laundry room go down. How long will they leave nest? How do I get them to leave? Something may have happened to the parents or poison in there food supply. Parents are around we see them . We did notice one had a large pic like wound in its neck.